Since then, Nick has personally performed all services provided by Nisat Electric, ensuring that EVERY customer receives the best care. The business has thrived through word of mouth referrals and careful management of the work he accepts allows Nick to provide high quality work and develop good relationships with all of his customers. We believe in honesty and integrity and want to provide you with a better experience than you've had with electricians in the past. That's why Nick will answer all of your questions up front. Our commitment is to provide you with fast electrical services, exceptional results and premier customer service! Before you hire someone to complete electrical work in your home, please take a few minutes to read Reviews from Nisat Electric customers. 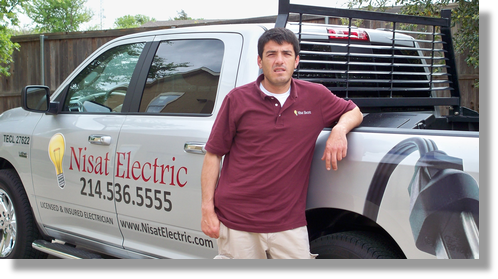 Call Nisat Electric today at (214) 809-9988 to find out how Nick can assist with your electrical service needs! Nick earned a Bachelors degree in Electrical Engineering in 1999 but he didn’t stop there! In pursuit of his dream to own and operate his own electrical contracting business, Nick trained under the supervision of Master Electricians for several years before starting his own business. Nick is proud to maintain three licenses including Electrical Contractor, Master Electrician and Journeyman Electrician. For additional information about our licenses including how to verify our licensure status, please visit our Licensure page. To better serve the needs of his customers and ultimately provide the best service possible, Nick earned a Masters in Business Administration from Texas Woman's University in 2010.